In an experiment with an Ostwald Viscometer, the times of flow of water and ethanol are 80 s and 175 s at 20 °C. The density of water =0.998 g/cm³ and that of ethanol 0.790 g/cm³. The viscosity of water at 20°C is 0.01008 poise. Calculate the viscosity of ethanol. An experiment was performed that measured the flow rate of four different liquids as temperature was increased. 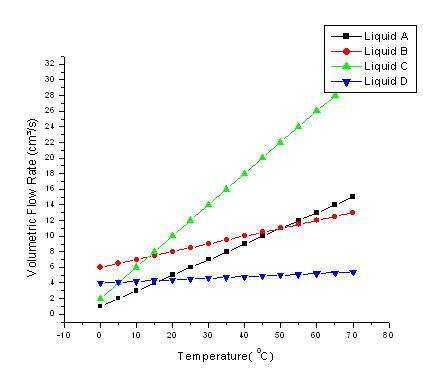 According to the graph, which of the liquids had the greatest viscosity at a temperature of 30°C? The dimensional formula of coefficient of viscosity is...........? How does the viscosity of a liquid change with temperature? In an experiment with an Ostwald Viscometer, the viscosity of toluene and water at 30o C is 0.579 and 0.8007 poise.The times of flow of water and toluene are 41 s and 34.5 s. The density of water is 1.002 g/cm³ . Calculate the density of toluene.